400,000+ Sign Petition To Move 'Sad Bear' To Better Life In Canada : The Two-Way Arturo the polar bear, living in a cramped and hot zoo enclosure in Argentina, is the subject of an online campaign that includes former House Speaker Newt Gingrich. Arturo, the only polar bear in Argentina, lives in captivity at a zoo in Mendoza. The plight of the "sad bear" has spawned more than 400,000 signatures on a petition to get him moved to a "better life" in Canada. Updated at 1:20 p.m. ET. 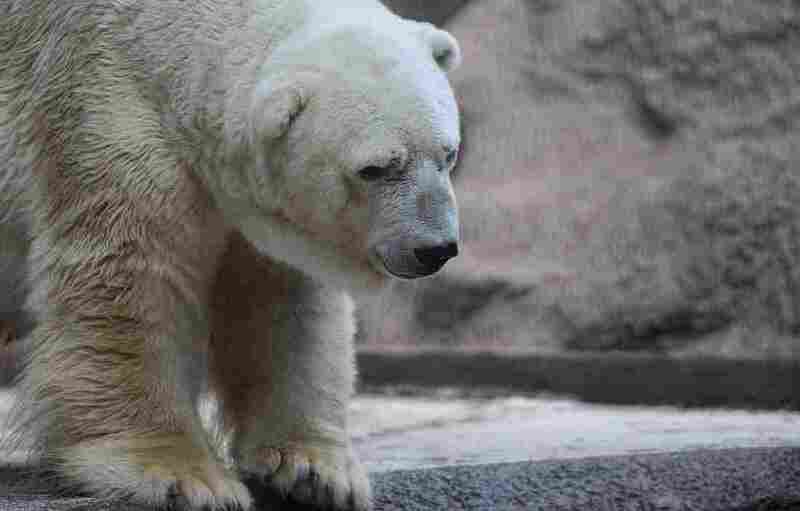 Social media has dubbed Arturo, a polar bear living in an Argentinian zoo, the "world's saddest animal," and more than 400,000 people have signed an online petition asking that he be moved to a "better life" in Canada. Photos of Arturo, 29, looking distressed and lying flat out on his stomach that have circulated online prompted the petition. The bear's enclosure mate, Pelusa, died two years ago, the BBC says. According to The Telegraph, "Arturo is currently being kept in a cramped, concrete enclosure at Argentina's Mendoza Zoo, where temperatures can climb to 104F (40C), with just a 20-inch-deep pool for him to keep cool." Even former House speaker and GOP presidential candidate Newt Gingrich has gotten into the act, posting a video on his Facebook page urging people to sign the petition. However, as The Washington Post notes wryly, the only thing missing from the Gingrich post "was a link to the actual Change.org petition." The bear's plight has also spawned the Twitter hashtag #FreeArturo. The Telegraph reports that animal rights campaigners say Arturo is exhibiting the same depression and mental health issues that Pelusa showed before his death, including pacing back and forth and rocking from side to side. "Earlier this year, the director of Mendoza Zoo, said it would be 'unsafe' to move Arturo because of his advanced age. "Canadian tabloid The Winnipeg Sun reports that Arturo cannot be transferred as the zoo does not have up-do-date medical records for the stricken bear."